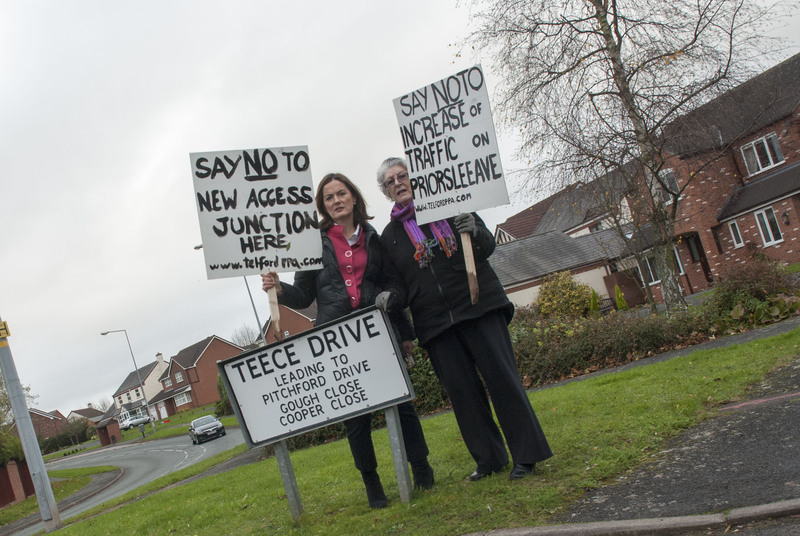 Veronica Fletcher, Councillor for Priorslee, who has always welcomed the new school, is concerned that the siting of the access to the new Holy Trinity Academy in Priorslee will create a dangerous increase in traffic. Cllr Fletcher told the Council’s Planning Committee on Wednesday 4th December, that traffic on the road is a “nightmare” already – with a factory, a primary school and a supermarket all on the proposed access route to the school causing traffic woes for residents. The 900-pupil Faith Academy will use narrow Teece Drive as the primary route in and out of the school. Cllr Fletcher says that access to the school should be from Castle Farm Way, a main road nearby. At the same meeting the Plans Board also approved the siting of a Travellers’ Transit Site on Symonds Yard, Snedshill, Telford. Cllr Fletcher told the Plans Board that whilst a statutory duty exists to provide sites for travellers and gypsies the Council must comply with CTAAP (Central Telford Area Action Plan) and NPPF and this siting was in breach of both. She told the Board the Council had no authority to change the use, as was being proposed. She drew the Plans Board’s attention to the 260 objections received by local residents and businesses. Despite objections the Plans Board approved both applications. Cllr Fletcher showed local campaigner and prospective MP for Telford, Lucy Allan around both sites to explain the impact on the area. UKIP Telford & Wrekin have also vowed to continue the fight against the siting of a transit camp for travellers on prime development land in Snedshill. Members of Telford & Wrekin plans board met with angry scenes and cries of “shame” from members of the public as they ignored the 269 objections and 244 signature petitions and approved the change of use for two years. UKIP Parish Councillor for Brookside, Stuart Parr, has made a complaint to Telford & Wrekin Council over the handling of the planning application after hearing the speeches prepared by council officers which were more concerned with convincing councillors to approve the application than providing the impartial advice that is required of them and for being misled by the council who incorrectly told him that only one person was allowed to speak against the application and that someone else was already registered to do so. He has also requested an apology from the Chair of the planning committee, Cllr John Minor, for his rude and unprofessional behaviour. Cllr Parr said “I was confused when Cllr Minor told the other councillors that everyone who wanted to speak had been given the opportunity to do so when I had been told by a lady at the council that I wasn’t allowed to speak because only one person was allowed to and that someone else had already registered. I asked Cllr Minor if that was untrue and when he confirmed it was I told him that I had been lied to by the council and asked if I could speak at which point he became angry and rude and started asking me to leave for interrupting the planning process. When I left at the end of the meeting I told him that I thought he was rude and in front of about 40 members of the public he told me that I was being rude. I sent him an email last night and offered to accept an apology instead of making a complaint about his behaviour and he replied shortly afterwards telling me he was just keeping order but made no apology for breaching the Councillors’ Code of Conduct. This is the same kind of unprofessional behaviour I saw at the full council meeting a couple of weeks ago at TCAT. They tried to throw me out of the meeting for asking to speak after a council officer lied to me and told me I wasn’t allowed to speak. Myself and another UKIP activist were there and tried to correct council officers when they were misleading councillors but the councillors didn’t want to listen. We also spoke to a lot of unhappy residents who want to continue the fight against both the traveller camp at Snedshill and the ridiculous school entrance on Teece Drive. Lucy Allan is trying to muscle in on these but she couldn’t be bothered to come to the council meeting, she’s just sending her picture out to the press claiming to be the voice of the residents. As is so often the case the State decides what is best for the us and we the people get ignored. Planning, not just in Telford & Wrekin, is too often the top down imposition of a grand plan by bureacrats, with the costly charade of a sham consultation, leaving people feeling disenfranchised and conned.